EVERETT, Wash., Aug. 27, 2014 -- Boeing [NYSE: BA] and Royal Jordanian today celebrated the delivery of the airline's first 787 Dreamliner. The airplane, a 787-8, is seen here at Boeing's Everett Delivery Center. EVERETT, Wash., Aug. 27, 2014 /PRNewswire/ -- Boeing [NYSE: BA] and Royal Jordanian today celebrated the delivery of the airline's first 787 Dreamliner. The airplane will play a central role in the Amman-based airline's strategic plan for fleet modernization. Royal Jordanian acquired this airplane through leasing company AerCap. "We are delighted to receive our first 787 which will not only revolutionize the inflight experience for our passengers but also help Royal Jordanian increase its competitiveness both regionally and internationally," said Royal Jordanian chairman of the board, president and CEO Nasser Lozi. "Our decision to invest in this game-changing airplane reflects our firm belief in its unrivaled capabilities and will allow us to offer passengers an unmatched level of comfort, on both short and long haul flights." The 787 is the world's most technologically advanced airplane with composite materials making up 50 percent of the primary structure by weight, including the fuselage and wing. In addition to bringing big-jet ranges to midsize airplanes, the 787 will provide Royal Jordanian with unrivaled fuel efficiency, using 20 percent less fuel than today's similarly sized airplanes. With this delivery, Royal Jordanian becomes only the second airline in the Middle East to operate the 787. 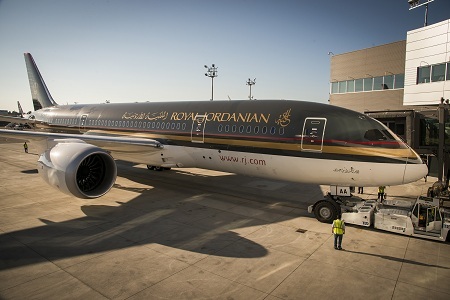 "The Middle East is one of the world's highest growth areas for commercial aviation and we are proud that Royal Jordanian has selected the 787 to spearhead its fleet modernization strategy and route expansion plans," said Ray Conner, president and CEO, Boeing Commercial Airplanes. "We look forward to further strengthening our partnership with Royal Jordanian well into the future." In addition to providing airlines with unprecedented fuel economy and low operating costs, the 787 features a host of new technologies that greatly enhance the passenger experience. The airline will configure its Dreamliner to carry 24 passengers in business class and 246 in economy class. Royal Jordanian customers in all classes will also experience cabin environment improvements such as LED mood lighting, larger windows, bigger overhead bins, lower cabin altitude and enhanced ventilation systems among other features. To support Royal Jordanian's Dreamliners, Boeing is providing a comprehensive suite of support and services through its Commercial Aviation Services business. Royal Jordanian has received flight and maintenance training and will be using Airplane Health Management, a diagnostic and predictive capability that evaluates airplane operations data while airplanes are in flight and notifies ground crews of potential maintenance issues; a Rotable Exchange Program that provides a dedicated pool of high-value, mission-critical parts and manages inventory at a reduced cost; and Maintenance Performance Toolbox, a digital real-time-information tool that enables quick resolution of airplane maintenance issues. Royal Jordanian currently flies a network of over 50 global destinations and plans to deploy the Dreamliner on services to North American destinations as well as to Asia, Europe and the Middle East. To date, more than 180 Dreamliners have been delivered to 20 customers worldwide.